Healthy and balanced meals not only fuel our bodies, but also help fuel our brains. With that in mind, take a look at school cafeteria food from around the globe and ask yourself, "How does the United States measure up?" Spoiler alert: not very good. When you consider how many students end up eating school-provided lunch, you realize how important it is that they get healthy and balanced meals. That's why sweetgreen, the organization behind this photo project, is committed to helping students make healthier lunch choices through its sweetgreen in schools program. Sweetgreen in schools isn't just about healthy eating; they also teach students about fitness and sustainability throughout workshops across Washington D.C., Maryland, Virginia, and New York City. 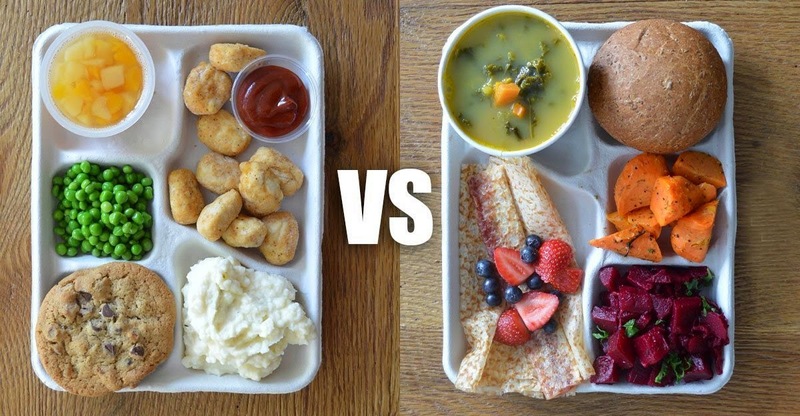 Each meal pictured doesn't represent every school meal from that particular country, of course. Lunches at one school in Florida will look completely different from another school in New York. The same goes for schools abroad. So for this photo project, sweetgreen looked at various government initiatives, food programs, and nutrition policies and matched that info to amateur photos of school lunches worldwide found online, then re-created them. Here's hoping programs like sweetgreen in schools will become more commonplace across the country to help our kids fuel their bodies and brains with the best and healthiest food options! If you agree that the United States should work to provide our kids with healthier school lunch options, give this post a share.